Does anyone know what this thread-like material to the right on the picture is? Does it have anything to do with grounding? It is a Cat6 U/UTP cable. It is used to split the outer shielding away without needing to use a sharp object which could potentially damage the wires themselves. It is commonly called a ripcord. Its called a ripcord and is used to cut thru the outer casing of the wire so you don't have to use a knife. To those who say it is not strong enough your not using it right. Grab it with a pair of needle nose pliers wrap it around the tip a couple times and then pull back it works perfectly. I have used it as a ripcord for more than 30 years. Granted on really cheap cables it does not work well but then those cables don't work really well for network use either as the twist on the wire is not correct either. To the person who said it is to support the cable when pulling it, WRONG it does no good for that. It has nothing to do with grounding or shielding -- those have to be metal, or metalised plastic. Do you have a reference for the cable? I think you're all talking about two different things. There's ripcord and strength yarn. The Kevlar or nylon stands that surround the pairs can be used to strip the jacket, but are there to ensure that the whole assembly can withstand the specified 100lbs of pulling force without breaking. The single string (as shown in the previously shared graphic) that is often included is intended only to assist in stripping the jacket. 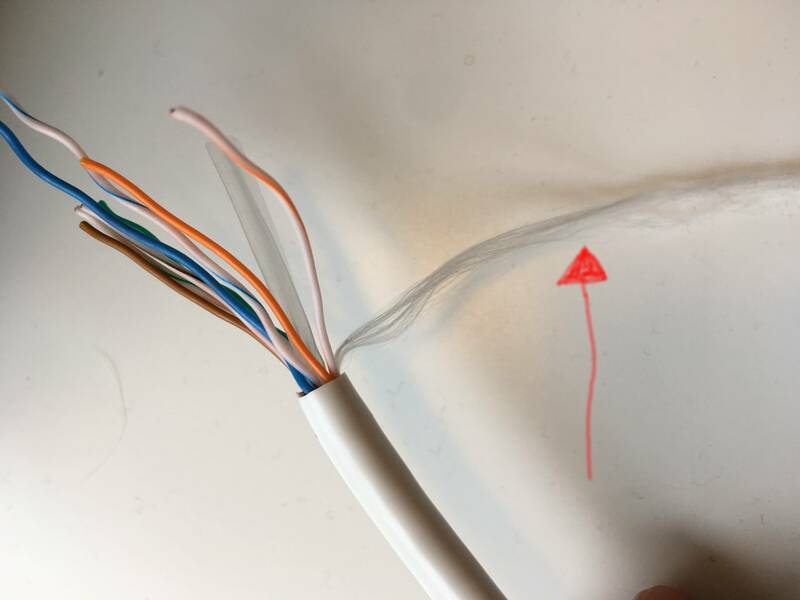 Left over from the manufacturing process Helps stop wires from bending too sharply There's also powder in the cable to help with any moisture, I wonder if this fibre string holds the powder. Not the answer you're looking for? Browse other questions tagged layer1 cable cabling utp or ask your own question. Is F/UTP cabling compatible with an STP patch panel? Why exactly is soldering discouraged in UTP networks? Where are UTP cable speeds defined for Ethernet?